Featuring: Christopher Guest, Eugene Levy, Catherine O'Hara, Michael McKean, Parker Posey, Jane Lynch. Director: Christopher Guest. For those of you whom are unaware, Christopher Guest is the unchallenged king of the "mockumentary" genre of film making. He was the brains behind the huge hit This Is Spinal Tap and created other cult classics such as Waiting for Guffman. To direct and write that sort of movie you have to have the sort of mind that can spot the absurd in the mundane. 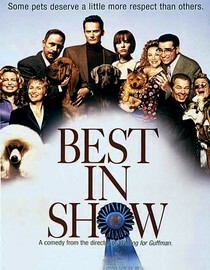 After all, Best in Show is a movie about dog shows. The only thing I have ever remembered about dog shows is that my grandpa would fall asleep in the kitchen watching them on television while my grandma cooked. They aren't the most exciting things in the world. Unless you have the sort of mind that can see the craziness that most of us don't recognize at first glance. Throw in good comedic actors who know how to play their part and give them some really funny lines to deliver, in an understated but somehow outrageous manner, and you end up with a damned funny movie. You get great comedic timing, a lot of laugh out loud jokes, and evidence as to why Christopher Guest will always be the master mockumentarian. Very funny stuff, queue it up. You'll never look at a dog show the same way again. Why is it in your queue? I've had people tell me it was funny. They were right. What stood out the most to you? Probably the woman that slept with pretty much every bald guy in the movie, that cracked me up each time. What mood should I be in to watch this movie? Looking to laugh or in the company of one of your friends that keeps her pooch in her purse.